Want to look your best for your headshot shoot? 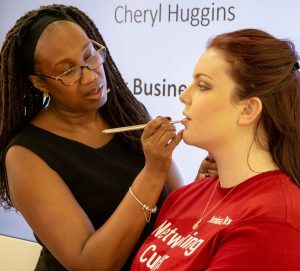 Here are some top tips from makeup expert Cheryl Huggins. Lots of women ask me about makeup for their headshot shoot. Many say they don’t usually wear makeup but think they should ‘glam up’ up a bit for the camera. My message as a photographer is always that you should feel comfortable with how you look during your shoot, and your photo should reflect what you look like in real life. If you don’t normally wear a lot of makeup when you’re working or meeting clients, you don’t have to look glamorously made up in your professional photos. However, some well applied makeup goes a long way to helping you look your best self in front of the camera. Cheryl says “Use warm powders and creamy textured cosmetics to flatter your skin under the lights. Even coverage of foundation on well-moisturised skin is essential”. 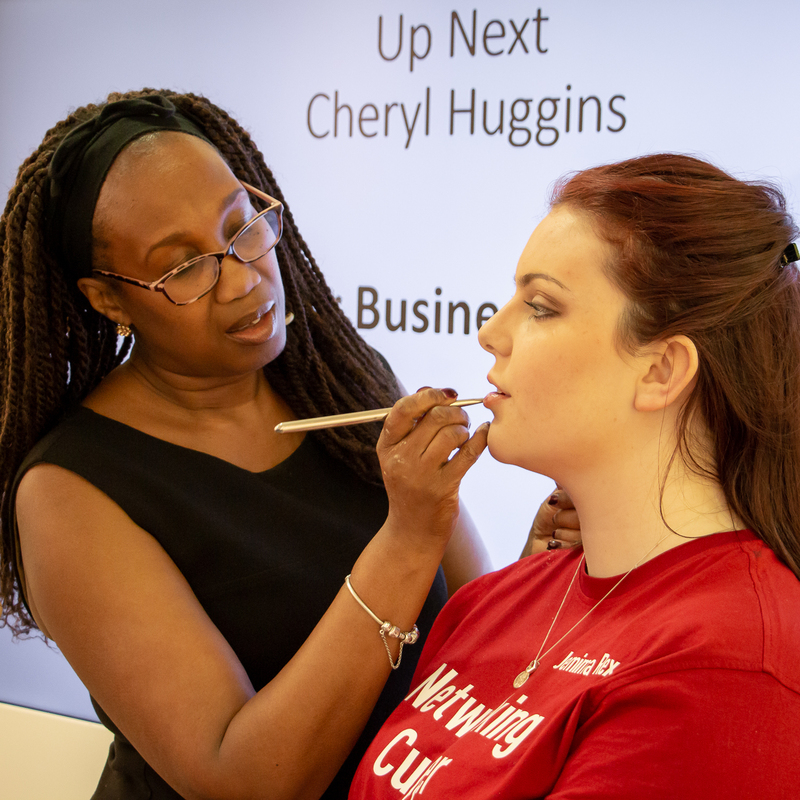 I recently saw Cheryl in action, giving a live demo on applying makeup for a business look – I learnt so much! Create a lift to the eye area and enhance your features with defined and perfectly arched eyebrows. For photographs your brows need to be matching and ideally have been groomed and defined by a brow professional. You can maintain the shape by removing stray hairs with tweezers. Use brow pencils, powders or a wax, starting at the inner end of the brow using light natural strokes that resemble real hairs to achieve a natural look. For thin or sparse brow hair, use a brow serum. Or tinting your brows provides more intense colour and lasts up to 4 weeks (which will also save you time in your usual morning make-up routine!). Finding the right shade of blusher is key. Try naturally flattering corals or soft rose tones. Or for ladies of colour, brown and copper shades look amazing. Avoid harsh reds or bright pinks as these tend to give a painted doll look under the lights! A pop of blush on the apple of the cheeks adds immediate warmth to your skin. Use a fan brush to create an even and smooth application – tap the brush before application to remove excess powder and use a slow light sweeping action for the best results. Choose a shade that will complement your natural makeup look without being too harsh on camera. Lip liner is not always needed, but to enhance the cupid’s bow with precision start in the centre of your lips with a sharpened lip pencil and work out to the corner blending with a clean lip brush. Blend then blot lipstick to ensure a longer lasting finish. Gentle exfoliation of the lips will ensure that the lipstick application is always smooth – use lip balms and lip oils to condition and repair dry chapped skin. There are more of Cheryl’s beauty secrets for professional women on her website. Cheryl Huggins is an experienced and professional licensed makeup artist. 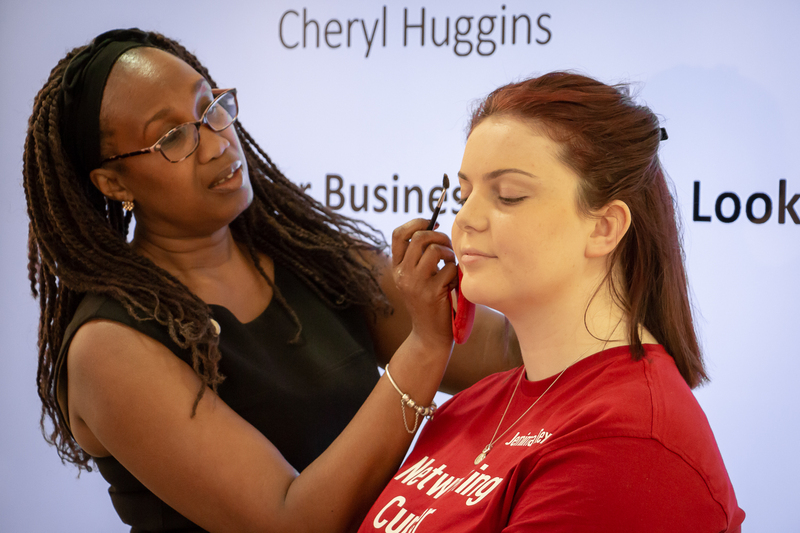 As well as makeup for photo-shoots, she offers a personal makeup shopping assistance service and a makeup masterclass, so you can learn to apply your makeup like a pro! There is more information on my professional headshot service and how I work with Cheryl here. Or feel free to get in touch.